Dr. Harms explains why children, like adults, should see their doctor for annual checkups. Q: My child isn’t sick. Why should they get a checkup? A: A yearly checkup – known as a “well-child visit” ─ helps monitor your child’s development and can spot potential health problems. The visits also help your child develop a positive relationship with their doctor, a relationship that will become the foundation of good health care throughout your child’s life. Most parents are good about bringing babies and preschoolers in for regular appointments, but after children start school, visits tend to drop off. When that happens, we miss a lot of opportunities to help kids grow up healthy. Q: What happens during a well-child visit? A: We track your child’s growth and development, including their vision. It’s surprising how many kids start school with vision problems, which can impact their ability to learn. We can help detect issues so kids can do well in school. Children change a lot in 12 months, and we can tell you what to expect in the coming year. If you have questions or concerns about your child’s health, we can answer your questions and direct you to health resources. We can help teach your child good health habits, like eating healthy, getting enough sleep, and balancing screen time with active play time. The annual visit is also a good place for kids to learn how to deal with social pressures they will encounter at various ages, including relationships, drinking and drugs. Q: What else happens in the appointment? A: We will make sure your child receives any needed immunizations, including measles, polio, tetanus, diphtheria, pertussis and influenza (flu). Kids who don’t see their doctor regularly miss these vaccines and are at higher risk for serious illness. In fact, many college-age kids have missed important immunizations, even though some diseases are most likely to occur in the teenage years, such as human papillomavirus (HPV) and meningitis. Q: What problems do you typically see? A: There’s a big problem with children not getting enough physical activity. With too much time spent watching TV, playing video games or being on their phones, many kids don’t build bone strength or develop good cardiovascular health. Inactivity during childhood can lead to serious problems later, including obesity, heart disease and diabetes. Also, some of the kids we see don’t get enough sleep. We live a crazy 24-hour society, and children get drawn into that. Kids ages 6-13 need 9-11 hours of sleep each night, and teens need 8-10 hours. Lack of sleep can cause emotional and behavioral problems and poor performance in school. Q: When should my child get a checkup? A. It’s a helpful reminder to schedule the visit near your child’s birthday each year. And many MPCP offices have extended hours, so you don’t have to pull your child out of school. Setting good health habits early makes a real difference. The whole idea of staying healthy starts with seeing the doctor once a year. It’s never too early to start building a healthy life. 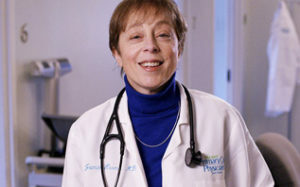 Dr. Harms is an MPCP partner and is certified by the American Board of Family Medicine. She received her medical degree from University of Maryland School of Medicine and completed her residency program in Family Practice at University of Maryland Medical Center. She sees patients in MPCP’s Queenstown office.